Please see the description in the attached image. Thank you for posting. I have tested this on our end and have been unable to replicate this (I might be missing something). Can you provide a step-by-step scenario describing how to replicate this or we can set up a Web Meeting to go over it in person. That's great. Thanks for the video. I was able to replicate it. Would you mind keeping that video available? I will report this to our developers and reference the video so they can easily replicate this as well. In the meantime, I noticed if you double-click the note tab to extend the notes area all text will be visible. 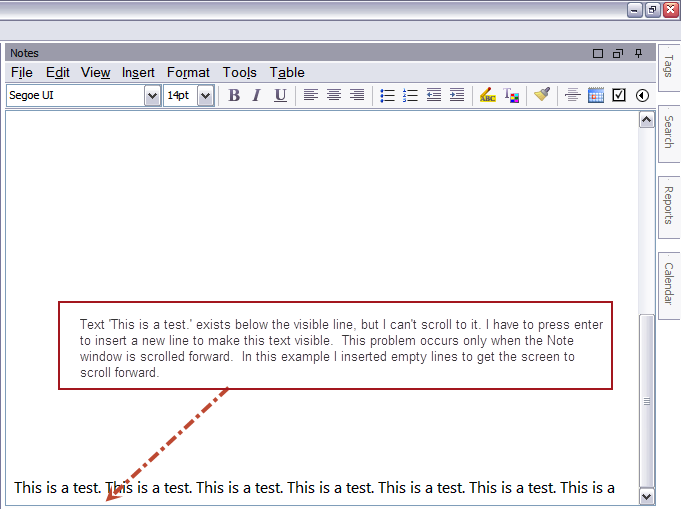 In my case it occured when pasting text into a notes window where already some text is. Several lines of the pasted text are hidden below the border of the notes window.